Danny Antoine Rollen Faure was born on 8 May, 1962 to Seychellois parents in Kilembe, Uganda. He has five children and four grandchildren. He completed his primary and secondary education in Seychelles and graduated with a degree in Political Science from the University of Havana in Cuba. Upon his return to Seychelles in 1985, he worked as an Assistant Curriculum Officer with the Ministry of Education and Lecturer at both the National Youth Service and the Seychelles Polytechnic. In June 1989, he was appointed Director of the National Youth Service. As a young man, Danny Faure worked with the Seychelles People’s Progressive Front. He became the Chairman of its Youth Wing and was elected as a member of the Central Committee of the Party. In June 2009, he was appointed Secretary General of the Party. 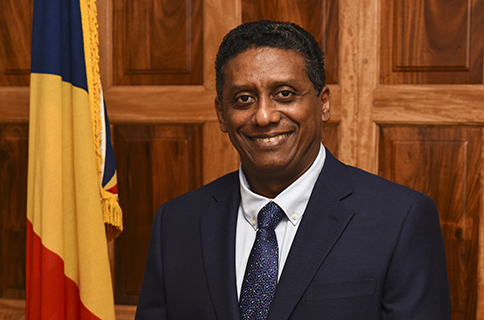 With the return of Multi-Party Democracy in Seychelles in 1993, Danny Faure was appointed Leader of Government Business of the majority Party in the National Assembly, a post he served for 5 years from 1993 to 1998. Danny Faure was appointed as Minister on 28 March 1998 when he became Minister for Education. In 2001, he assumed the role of Minister for Education and Youth, which he held until 9 August 2006, when he was appointed as Minister for Finance. He was assigned portfolio responsibilities for Trade in July 2007 and Industries in August 2009. He oversaw the implementation of the first generation of reforms under the IMF macro-economic reform programme which started in October 2008. He continues to direct the second generation of reforms as part of the on-going economic programme. Danny Faure served as Designated Minister from April 2004 to June 2010. On 1 July 2010, Mr Faure was appointed Vice-President of the Republic of Seychelles, holding Ministerial portfolios for Finance and Trade, Public Administration, and Information Communication Technology. On 16 October 2016, Danny Faure was sworn in as the President of the Republic of Seychelles. He is the Head of Government and holds the Ministerial portfolios of Defence, Public Administration, and Legal Affairs.